Located in the heart of Indiana is a town called Speedway. It’s the namesake of the Indianapolis Motor Speedway. Founders Arthur Newby, James A. Allison, Frank Wheeler, and Carl G. Fisher began the town’s creation in 1912. Their objective was to make a community that didn’t have horses and to have people who would work in the nearby industrial plants since the automobile was a new form of transportation at the time. It was then incorporated 14 years later. 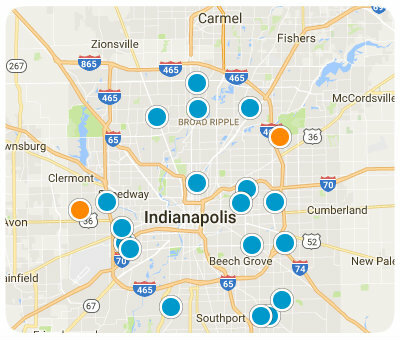 Speedway is approximately six miles from Indianapolis, and you can commute to the city via vehicle or public transportation. Speedway, the “Racing Capital of the World,” has about 12,000 residents, so it possesses a small-town feel. Even though this town is famous for having the world’s highest-capacity sports venue, there’s more to it than racing-related activities. Along Crawfordsville is where you can find chain retailers and restaurants like White Castle, Sears, Kroger, Arby’s, and more. There are two parks here: Leonard Park and Meadowood Park. Both parks have amenities like playgrounds, walking paths, sports areas, and shelters available for rent. Unlike Leonard Park, Meadowood Park has a gazebo. For more to do, you can take a short trip to Indianapolis and check out the Indianapolis Zoo. This zoo has over 300 species of animals as well as a botanical garden, an aquarium, a petting zoo, and other fun things for families to do. Speedway has six schools: four elementary schools, one middle school, and one high school. If you desire more education options for your child(ren), you can enroll them in any public or private school in Indianapolis. Forty-four percent of real estate properties in Speedway are single-family dwellings. Over 35 percent of residences are apartment complexes, and the rest consist of townhouses, mobile homes, and small apartment buildings. Most homes in Speedway were built between 1940-1969, so they’re fairly ancient and well-established. Many residential properties have an average of two bedrooms, though there are ones with more or less. Make the choice to move to Speedway. Not only is it known for its racing culture; it’s also a friendly town with good schools and an affordable cost of living. If you’re interested in homes for sale in Speedway, Indiana, please contact us today.